For 4 hours I have done nothing but stare out a window. Phone untouched, laptop unopened, dog-eared book disregarded. We are running low on water and haven’t packed suitable food provisions for this journey, which is taking far longer than the station guard told us. And yet I’m not the teensiest bit bothered. Up until this point I have seen train journeys as nothing but a burden. Something that must be endured if I am to get to work or travel across a country more cheaply. 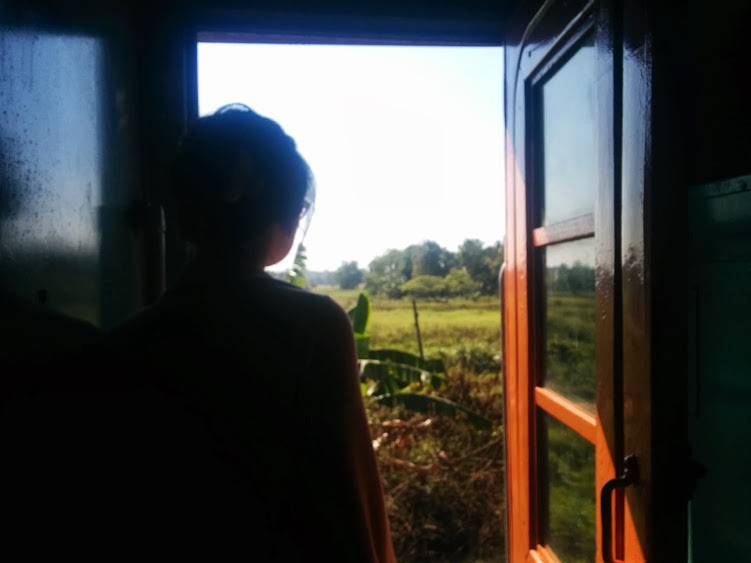 Of Thai trains I remember nothing but the swampy loos, in India there was an uncomfortable encounter with a persistently staring male passenger. 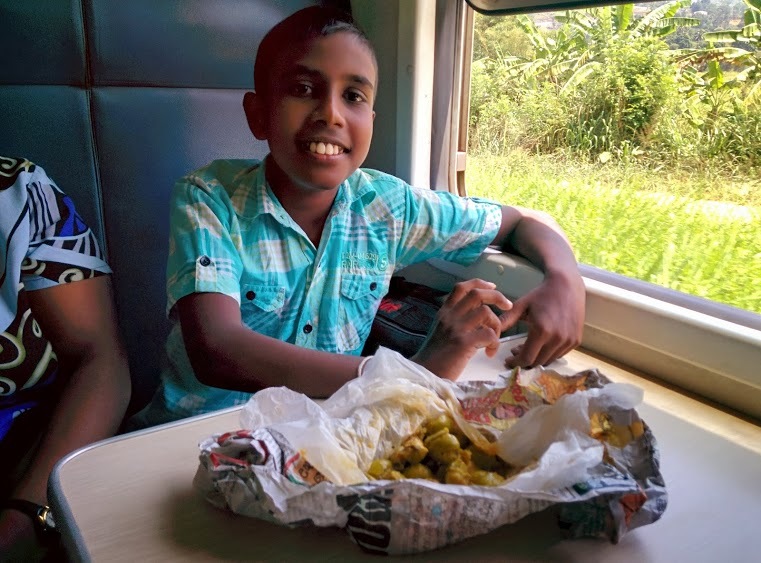 But train travel in Sri Lanka is different. Nothing matters on this train apart from what passes outside the window. The journey had started a little uncertainly. Nic and I arrived in Kandy via a short train ride from Colombo, the cinematic views on that journey a little taster of what was to come later. Knowing we planned to stay in Kandy for only two nights we queued to purchase our onward train ticket as soon we arrived at the station. Our next destination was the hill town of Ella and the train ride there from Kandy was said to be one of the most beautiful in the country. It was certainly a popular route and when I eventually got to the front of the queue the ticket office stated bluntly that we had no hope of travelling in the tourist class we requested. The only tickets available for the day we wanted (needed) to travel was in third class. We had no idea what this entailed exactly but had no choice other than to buy the ticket and wait and see what happened. I had read that sometimes tickets for tourists are released for the observation carriage on the day of travel. The ticket clerk just looked at me like I was mad. So we made our way to the designated platform after finding out its number from a board consisting of a series of wooden clocks. Each train was hours apart and there was a total of only 4 platforms at this busy city station. When the locomotive chugged into the station we picked up our luggage and dove into the scramble to try and find our designated seating. A guard pointed us into a door after a family of Sri Lankans and we took a deep breath and climbed in. Third class train travel in Sri Lanka is a lot different to what I imagined. Firstly, everyone has assigned seats so there was no one in the carriage that shouldn’t be. Unlike commuter trains in India, which fill up until men burst from the open doors and windows, in our carriage there was simply a handful of silent families sitting in their respective compartments. The low cost part of the carriage was definitely apparent in the seating, the hard plastic bucket seats would no doubt be uncomfortable after 6 hours, but I was relieved to see there were overhead racks for the luggage and a fan in each corner of the carriage. A sore bottom was likely to be as uncomfortable as it got on this journey. Somebody was sitting in our seat though. Nic and I had pre-booked 1 window seat and 1 aisle and figured we would take turns to have the one with the view at different points of the journey. We were supposed to be seated alongside each other with a small table separating us from the two passengers opposite. Except there were 2 passengers already in our booth and they had both nabbed the window seats. A kindly faced Grandma and her doe-eyed Grandson were about to meddle with our best-laid plans. Generally it is not a good idea to have a disagreement with people you are about to share a small space with for 6 hours, especially ones whose language you do not speak and whose country you are trying to be a humble guest in. If the offending person has brown eyes and fluttery lashes and appears to be 12 years old it is probably advisable just to leave them be. But I so wanted to see, take in and photograph the anticipated view, if only we could communicate to this Grandma and her companion what we wanted to do. Eventually I must have stood there looking agonised long enough for the Grandma to take action. She told the boy to get out of our seats and let him have the window seat she was currently occupying. He begrudgingly got up and it seemed neither of them was going to forgive us for this imposition. Luckily about 2 hours into the journey relations were thawed and an olive branch was extended when the young boy offered us one of his (erm) olives. And then came that view. You know it was something special when I tell you it distracted me from my phone, laptop and book. The fact I did not even want for food relates how hypnotising just hanging my head out the window became. 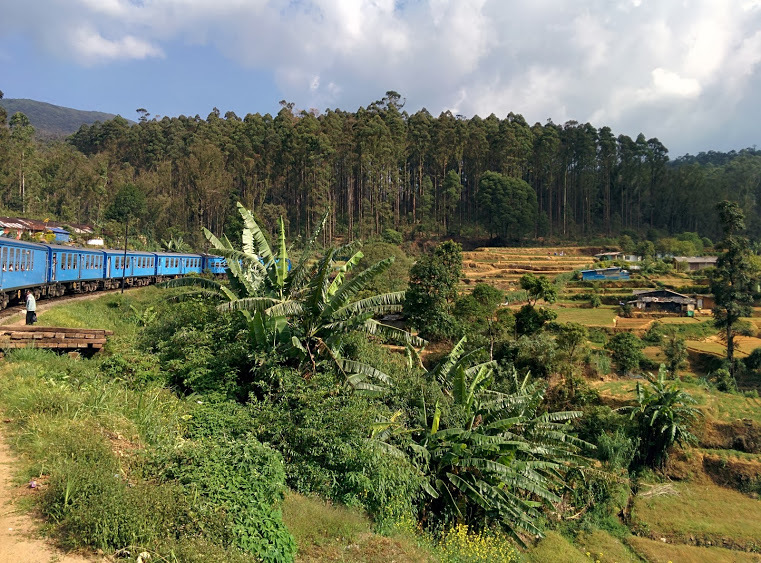 The train from Kandy to Ella takes you through rural villages, around productive towns, winding through tea plantations and fields being ploughed. The train climbs higher until surrounded by forest, the temperature noticeably cooler than the jungle we had traversed a few days prior. The rail lines are not just for trains in Sri Lanka; often the routes they have cut through jungle or mountainous terrain are used as pathways for pedestrians. These walkers line the track throughout our journey, standing to one side and letting the train pass as they wave their wishes to all on board. Children get excited to see the engine shudder through their peaceful towns, running out of houses to jump and shout. Paddies, valleys, waterfalls and fields are interspersed with these children’s cheers. And for almost 6 whole hours I am mesmerized, breath held in anticipation of what will happen next. What rock formation will catch my eye or steep drop arise and make me shudder inside. After years of travelling, racing through 40 countries in search of an exciting life, for once I am here in the moment. I couldn’t care less about where we are going or when we will arrive, I am simply enjoying the ride. Have you been the Sri Lanka? What did you love best about your trip? Next Post Dear Bloggers, Have We Forgotten About The Readers? 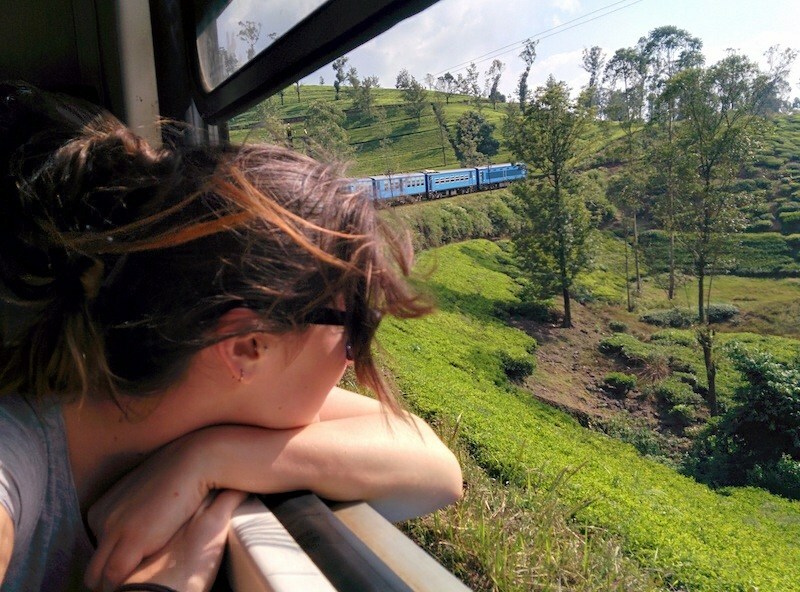 I so want to ride the train in Sri Lanka now! Seeing this wonderful landscape passing by must be amazing! It really was. I’ve never been so hooked on the rolling scenery as I was in Sri Lanka! Great story! Looking forward to hearing more! I heard that it was an amazing experience, but nobody ever described to me what it really was, what happened and how it was. O gosh… it sounds amazing! So glad that you could share this with us! Thanks Aria, it’s a pleasure to share the story! I loved this piece Jane. We’ve decided on Sri Lanka as our honeymoon destination and this made me wonder why I’m waiting??? How beautiful the way u put it all in few hundred words ..I can just close my eyes and do the trip..I have done this trek few dozen times .enough to be jaded .till I rediscovered the wonder in a foreigners’ writing . Well, nice to see the journey which evolved all around my life through an eye of a non native. Being a son, grand child of railwaymen who worked in the same railway line and being born in haputale (a town you mentioned) due to parents being posted there… it gives a goose bump pleasure to see this article on my birthday week. Some of my happiest moments travelling have been on a local bus or train. I look forward to hearing more!